Surface mounted pot filler by Kohler. Ergonomic Faucets. Ergonomics refers to the design of products for efficiency and safety. Ergonomic faucets designed for kitchens have the capability to fill large pots, extend to the lower area of a sink for food prep or cleaning dishes, and can be directed over a basin where water is needed. 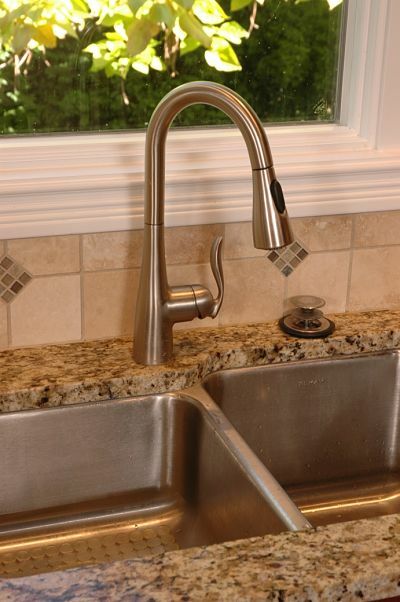 One of the latest innovations in kitchen faucets is the articulated faucet with pivot points that provide a full range of motion over a sink area. When not in use it folds down compactly. A Kohler ergonomic faucet with dual temperature controls and a dual basin sink. Lever Handles. Round handles require that you grip them to turn on a faucet or open a door. For people with joint inflammation or a hand injury, they may not be easy to use. Think of times when you’ve had your arms full and tired to open a door with a round handle. Not an easy task. Lever handles require the push of a hand. On sinks they make turning water on and off simple. Kitchen faucet with lever handle and detachable spray. Touchless Faucets. Faucets are places where bacteria and viruses are found. 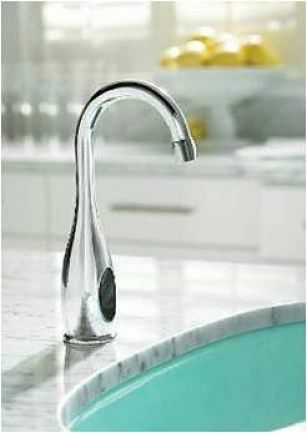 Touchless faucets are not only hygienic but make using a sink easier, especially for a person with arthritis. 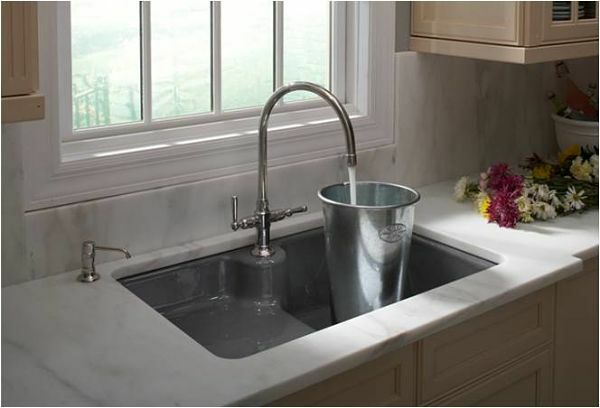 A Kohler touchless faucet with water filtration system is used on a bar sink. Pot Fillers. 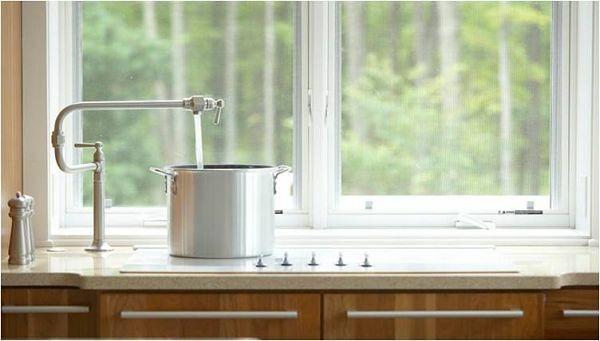 One the advantages of a pot filler placed near a range or cooktop is that you won’t have to carry large pots filled with water across the kitchen. Pot fillers have a swing arm that allows you to fill a pot placed on a burner. 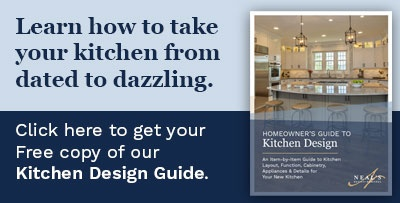 They can be wall mounted or surface mounted for use on an island or counter near a cooktop. 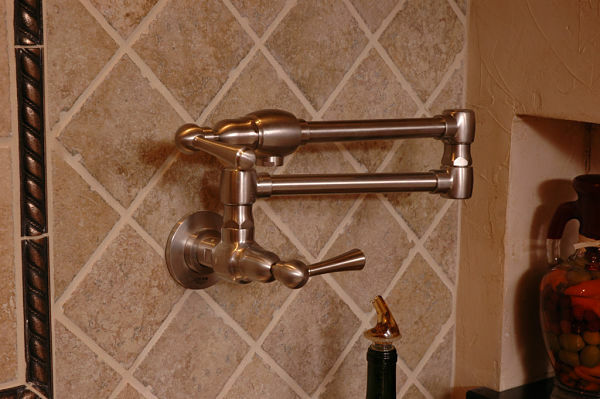 A wall mounted pot filler. When not in use the fixture can be turned toward the wall where it fits compactly. Accessible Sinks. While there are many styles of sinks, placement should be based on the needs of the users. Kitchen sinks that everyone can use have a clearance underneath to accommodate a person who uses a wheelchair or a petite person who may need a step stool to expand their reach. 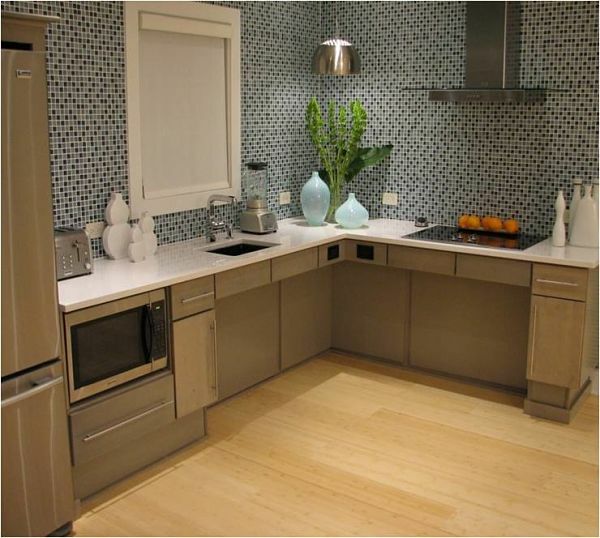 Sinks and other workstations in a kitchen require adequate circulation space. A five-foot turning radius is needed for wheelchair users. The height of a counter can also be adjusted to improve accessibility. This kitchen sink and stovetop area has a recess underneath that creates access for a person using a wheelchair or a walker. The recessed area will also help a standing user maintain balance when working in this kitchen. Photo by Kohler. Handheld Showerheads. Every home should have at least one handheld showerhead. Handheld showers make bathing young children much easier. Since you can control the water flow and spray, a handheld shower is ideal for shampooing your hair. If you have a dog, a handheld shower is a must. They can be installed in bathroom and laundry areas. A handheld showerhead can be used as a spray when mounted on a rod and adjusted to conform to the height of users. Handheld showerheads are also great for cleaning the shower stall or filling buckets for cleaning floors. 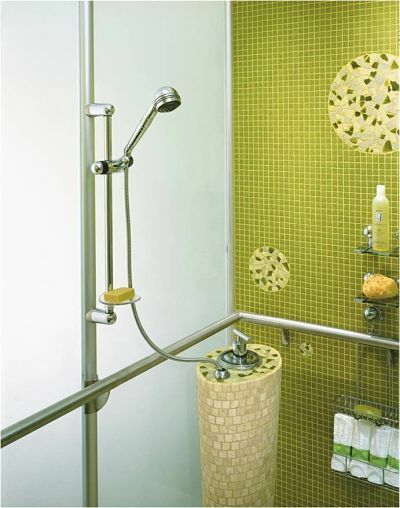 A Kohler handheld showerhead mounted on a rod in a walk-in shower with a grab bar surround. Grab Bars. For safety in the bathroom, grab bars benefit everyone. There are new products that are so subtle and beautifully designed that they blend into bath décor. One of the most innovative products is a bath tissue holder that doubles as a grab bar when placed near a toilet. 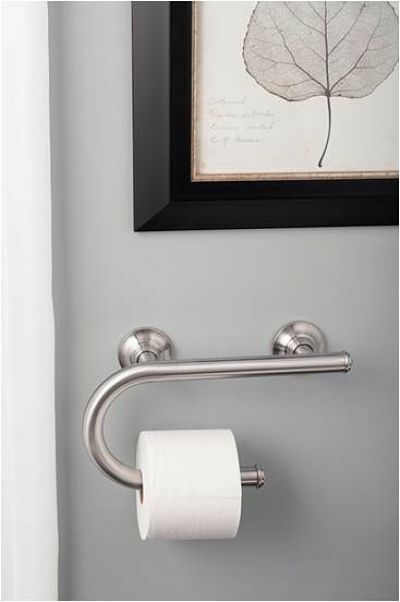 Other grab bars are decorative and look like towel bars. Grab bars can be integrated into a tub to make it easier to get in and out. A Kohler grab bar doubles as a bath tissue holder. 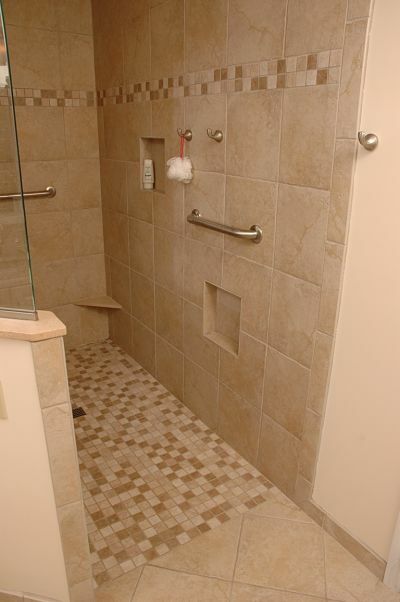 Two grab bars blend into this walk-in shower. 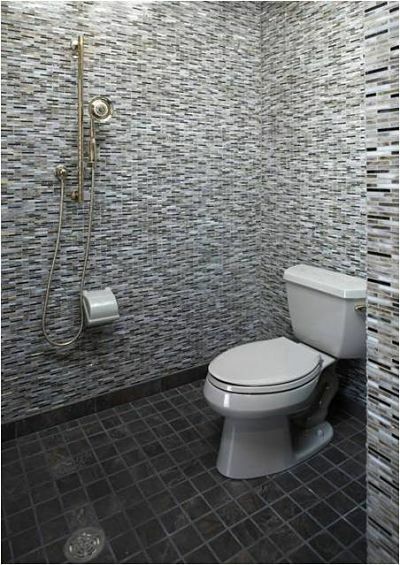 A grab bar is integrated with this Kohler tub. Wall Mounted Sinks. 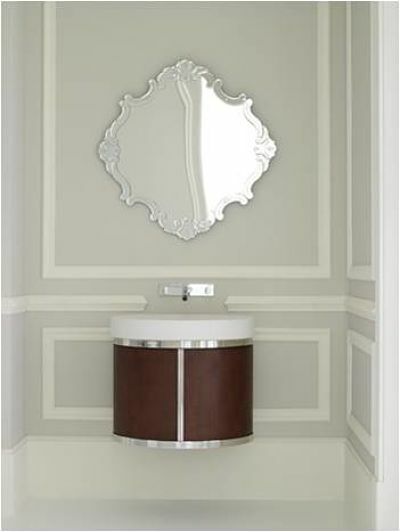 Wall mounted sinks have both a practical and aesthetic function in bath design. Wall mounted sinks take up less space. For users, the clearance beneath the sink supports balance. If a person uses a wheelchair, wall mounted sinks are more accessible. As for aesthetics, since bathrooms are often small spaces wall mounted sinks expose more of the floor making the room feel larger. A wall mounted sink by Kohler in a half bath saves space and adds an elegant touch. Comfort Height Toilets. There any many new innovations in toilets. Shapes are changing. There are now tankless toilets. Controls are changing. Trip levers are now located on the top of tanks. Seats are changing. Seats are designed expressly for users including young children who are new to toilet training. One of the most desired changes is a change in the toilet height. Comfort height toilets are chair height, 17-to-19 inches from the floor. A comfort height toilet by Kohler. Nightlight Toilet Seats. Lighting is always essential in a bathroom for both grooming and safety. A new innovation that makes a late night visit to the bathroom safer is a toilet seat with a night light featuring LED lights powered by a battery. Low or No Threshold Walk-in Showers. Walk-in showers with or without doors are growing in popularity among homeowners and are a hot trend because of the ease of access and maintenance. A walk-in shower and tub create a Universal Design “wet room.” Photo by Kohler. Shower and Tub Seats. 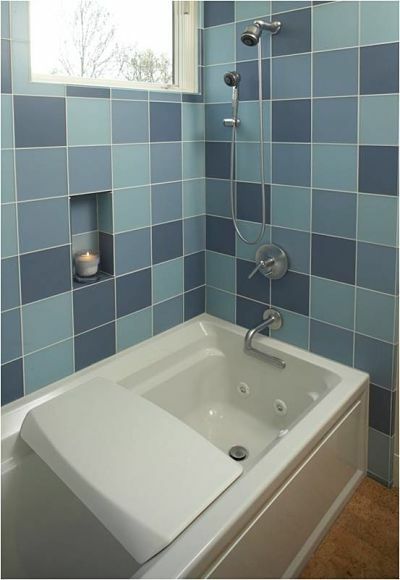 Shower seats provide comfort when grooming and are indispensable if you ever experience impaired mobility or an injury. Tub seats aid in the transfer when you are entering or exiting a tub. 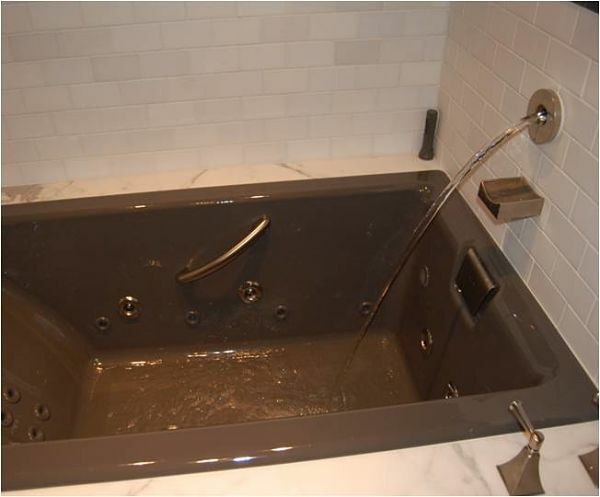 Kohler air jet tub with fitted seat.